Stylish and modern decor are not the only two attributes that one will find in Ku-Bu nightclub at Radisson Blu Hotel, as this venue offers a bundle of services and products to its valuable customers on each day of the week. Inhabitants of Dubai can take pleasure in these services, if they head to Dubai Creek in Deira region of Dubai where Radisson Blu Hotel is situated. The list of these facilities and leisure things include scrumptious bar food and popular Dj from United Kingdom. This Dj plays top and latest music at Ku-Bu six nights in a week and drag guests to the dance floor for dancing. Fine range of cocktails complete this tattoo-themed venue that is one of the most sought after nightspots in Dubai. Great bar food and array of libations are served to the guests upon order at this wonderful nightclub served. So apart from enjoying the terrific music played by imported Dj at this establishment, guests can also relish delicious food. On the other hand, famous British Dj Paul plays music at Ku-Bu so you will get to hear real foot tapping numbers at this nightspot. However, Dj Paul plays music at Ku-Bu each night except for Fridays. Therefore, his fans should come here between Saturday and Thursday. Since Ku-Bu is located in Radisson Blu Hotel, so guests would not face much problem while parking their cars because they have ample space for car parking. This nightspot opens daily and its opening hours are from 19:00 to 03:00. Radisson SAS Dubai Creek, Baniyas Road - Dubai - United Arab Emirates. Head south on 27th Street from Baniyas Square Metro Station 2, then turn right towards 27th Street before making a left turn onto 27th Street, after which commuters will turn slight left onto Al Maktoum Road/D 89 and later make a right turn onto 11th Street. Afterwards, pedestrian should turn left onto Baniyas Road where destination is located on the left side just few meters away. Deira, Beniyas Road 1 – Dubai bus stop is 300 meters walk from Ku-Bu Nightclub and it can be completed in about 4 minutes, if a bus user heads southeast on Baniyas Road towards 11th Street in order to arrive at this nightclub that will be on his or her left side. 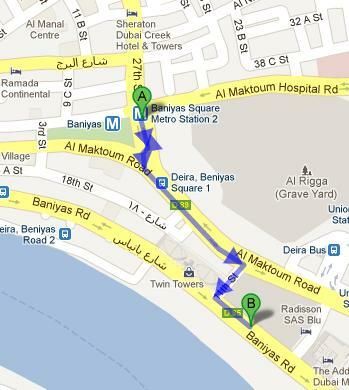 As far as bus numbers are concerned, use 27, 31, 53, C4, C7, C9 and C28 to arrive at Deira, Beniyas Road 1 – Dubai. View map for directions.